Well, when I say only just but humans have actually been eating and "using" them for 1000's of years, more so in the East and in traditional medicine and Lion's Mane is no exception, but it is EXCEPTIONAL! 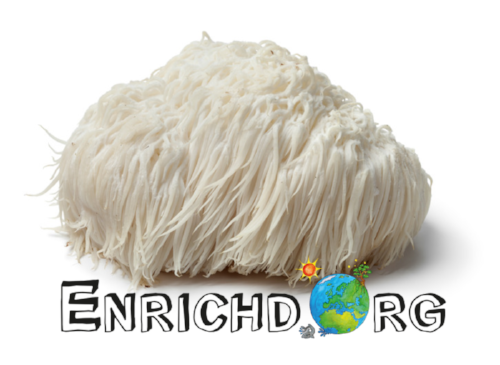 The key benefit of Lion's Mane is thought to be it's potential ability to support communication and connectivity throughout the brain. More science on this below the photo. Lion’s Mane (H. erinaceus aqueous) mushroom is one of my favorite mushrooms because the first time I drank it I felt its effects rather quickly. I was at a foodie event with our range of superfoods and had just got a fresh batch in but was yet to weigh and bag it. I put on my kettle and WOW did I have focus. It felt like I was able to speak in so much more detail but also much more concisely. Now, I'm totally aware this could have been placebo effect because I do know how Lions Mane can affect humans, but either way, wow this mushroom felt powerful. It’s a funny looking mushroom, and is named so because it looks a bit like a Lion’s Mane (obviously). I drink it on it’s own, with warm water or sometimes in smoothie because the ENRICHD Lion’s Mane is an extract. Lion’s Mane can also be added to coffee or even tasty hot chocolate (with a high quality cacao of course). Lion’s Mane is even well studied for it’s effects on the brain. Recent studies are assessing it’s effect on Alzheimer's patients. "Neurotrophic factors are important in promoting the growth and differentiation of neurons ... The aqueous preparation of H. erinaceus <Lion's Mane> had neurotrophic but not neuroprotective activities."